Marvão is a mountain village in Alentejo. 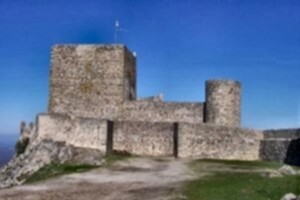 Buses run from Portalegre but you may need to change at Portavez. The information given in the bus station at Portalegre is not all you might wish and you do best to query the bus drivers! There are only about 2 a day so some planning makes sense. The castle is like a child's dream - whatever the child's age! There are turrets, a dungeon, an armoury and an inner castle - all free except for a small museum. The museum is nothing wonderful but it seems almost churlish not to pay the €1 admission. The village is completely walled and there is a short ridge across the top from the castle to beyond the church. The small traditional houses of Marvão, a medieval town with walls dating from the 13th century, seem to squeeze the narrow little streets that wind between them. Two of these village houses have been comfortably converted into the Pousada do Marvão, Santa Maria, a small charming hotel. Pension Casa D Dinis is at the top of the village and one of the nearest buildings to the castle. They own a snack bar just across the road. Very friendly. This page was last edited on 18 February 2010, at 00:01.